This article on qualifying for bad credit home loans in Ohio. Ohio, a Midwestern state located in the Great Lakes region of America takes its name from the popular Ohio River. French fur traders initially colonized Ohio, but it later became a colonial possession of the British after the 1754’s French and Indian War. Some people call Ohio “Mother of Modern Presidents” because of the fact that seven Presidents have come from Ohio since 1869. More interesting facts about Ohio? Columbus, the capital city of Ohio is the place where the American Federation of Labor was founded. The first person ever to walk on the surface of Moon, Neil Armstrong, came from Wapakoneta. Who hasn’t heard of the Wright Brothers? But, what many people don’t know is that they came from Dayton. Ohio is the first state that enacted laws to protect working women. Ohio is also known as the Buckeye State because there are many buckeye trees in the state. That was some general talk about the state of Ohio, but let us now move to the hot real estate market of Ohio. Currently, the median home value in the state stands at $131,000. In the last one year, the home value in Ohio has increased by 4.9 percent and market experts have predicted that the prices will rise by 2.7 percent within 2018. For homes that are currently listed in the state of Ohio, the median price stands at $149,000 while for homes that are sold, the median price is slightly less at $127,800. The median rent price in the state is $995. For cities in Ohio, Hamilton is leading on the home value as the median home value here is $140,200. Columbus has the median home value of $120,500, Cincinnati stands at $113,400, Parma $103,600, Canton $88,200, Akron $62,900, Toledo $58,600 and the median home value in Dayton is $52,000. 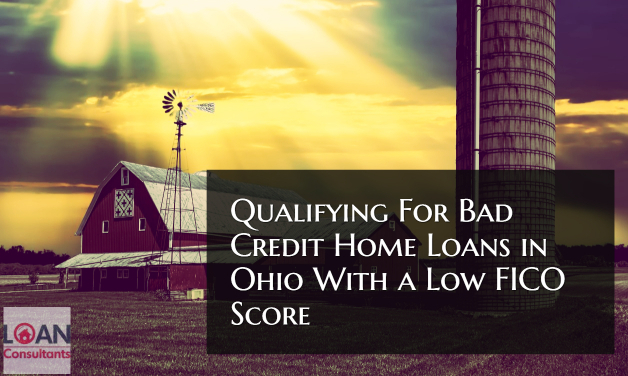 If you’re looking for a home in Ohio, but bad credit is holding you back from getting your dream home, then you should check out the bad credit home loans in Ohio. Let’s get to the details! At Loan Consultants, we have several loan programs for homes in Ohio to aid those people who have bad credit and are unable to qualify for Fannie Mae or Freddie Mae loans. The first option to consider is the Ohio FHA Home Loans. Federal Housing Administration (FHA) insures Ohio FHA home loan which allows borrowers to secure a home loan, if they fail to qualify for conventional loans. Borrowers with poor credit or low credit history are often able to get the Ohio FHA home loan. OH FHA loans are especially an ideal option for first-time homeowners because the down-payment is low and qualifying guidelines are flexible. There is also an option for refinancing with FHA loan where Ohio homeowners can refinance up to 97.5 percent of their home’s value. The limits of FHA home loan vary depending upon several criteria including how many units are there in the property, the particular location, etc. Please contact Loan Consultant for details about the FHA loan limits. Even if you don’t qualify for the loan programs we have to offer, we can assist you personally to repair your credit. Believe us, this is the step that you must take to get a loan for your dream home in Ohio. We’ll tell you some important things you can do to improve your overall credit score. The first thing you should do is get your credit balance on revolving debt below 33 percent utilization. It’s better to carry 3 credit cards at 33 percent balance than have just one that’s completely maxed out. This can boost your credit card score from five to forty points within five to seven business days. Furthermore, if you don’t have a good credit and you’re struggling to develop new credit, you should apply for a prepaid credit card in the amount of $500. This can really make a difference in credit. There are several websites available from where you can check your credit score. This won’t have any effect on your credit score and you can just tell the mortgage companies your score, if you don’t want them to pull it. Another option for those with poor credit history is rent-to-own. But, for rent-to-own in Ohio, you’ll have to pay a large amount in down payment. If you need more information about rent-to-own option, contact . Getting a loan for a new home in Ohio with bad credit is far from impossible. You just need to be aware of your options and contact the right people who can really help you. We at Loan Consultants are here for you, if you’re looking for bad credit home loans in Ohio. If you have been denied a home loan or have any questions about real estate or mortgage please contact the author, Matt Herbolich, MBA, JD, LLM by phone or text at 786.390.9499 or by email at mherbolich@usa-mortgage.com. Mr Herbolich works when you work, so feel free to contact him anytime.